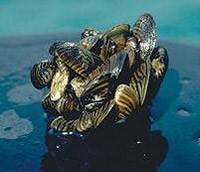 Zebra mussels (Dreissena polymorpha) are prolific invaders that cost the U.S. billions of dollar each year. These small mussels from Eurasia can clog water intakes and damage equipment by attaching to boat motors and hard surfaces. They can damage ecosystems by harming fisheries, smothering native mussels and crayfish, and littering beaches with their sharp shells. In the late 1980s, zebra mussels spread from Europe to the Great Lakes in contaminated ballast water discharged from foreign ships. From there, they expanded to the Mississippi River, its tributaries, and to inland lakes. Zebra mussels spread primarily by attaching to boat hulls, aquatic plants, nets, fishing equipment, or in water. Adult zebra mussels can survive out of water for days under certain conditions. Your actions are vital to prevent their spread. Zebra mussels are the only freshwater mollusc that can firmly attach itself to solid objects – submerged rocks, dock pilings, boat hulls, water intake pipes, etc. On smooth surfaces, young zebra mussels feel like fine sandpaper. Juveniles are about the size of peppercorns. Learn to recognize zebra mussels. Inspect and remove aquatic plants, animals, and mud from boat, motor, and trailer. Drain water from boat, motor, livewell, bilge, and bait containers. Dry everything for at least 5 days. Never introduce fish, plants, crayfish, snails or clams from one body of water to another. Report new sightings – note exact location; place specimens in a sealed plastic bag or store in rubbing (isopropyl) alcohol. Unauthorized introduction of zebra mussels, fish, or plants into the wild is illegal. Protect your property and our waters.